My skin is typical combination/dry, so I’m always looking out for a moisturiser that’s gonna quench the dryness without making my t-zone look like an oil slick. I also have the added bonus of sensitivity. Not hugely so, but if my skin isn’t liking something, it reacts by tingling, reddening and leaving little dry scaly bits once the redness subsides. After testing a new anti ageing night cream, I developed those unwanted sensitivity effects. I was left cursing and battling this by slathering on my Eucerin Q10 Active Fluid (love!) which always helps to tame the dryness without leaving the greasies – great stuff! However, as much as I love Eucerin, my fickle soul is well aware that it’s not kind to my purse at £17.51 for 50ml. So when I ran out, I was on the hunt for an alternative. 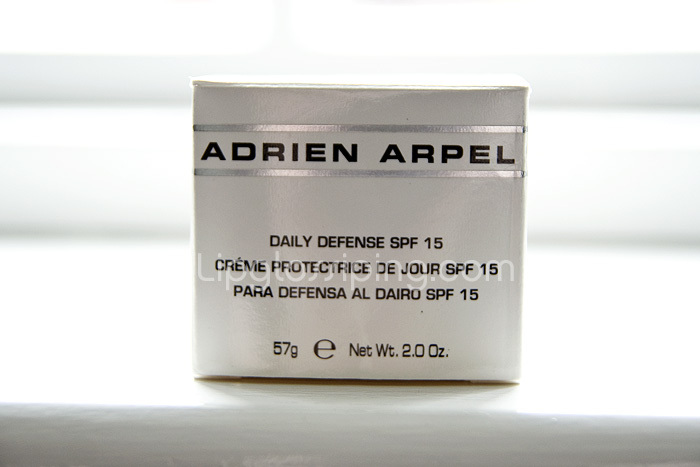 Enter Adrien Arpel Daily Defense Moisturiser SPF15. I came across this whilst browsing Direct Cosmetics for the princely sum of £4.99 (DC is one of my absolute fav places for bargain hunting – check it out!) and in hindsight I wish I’d bought more than one pot seing as it’s disappeared from the website now. I like my day moisturisers to have SPF, and during the summer months, I layer this with even more sunblock – either that or I end the day looking like Rudolph. 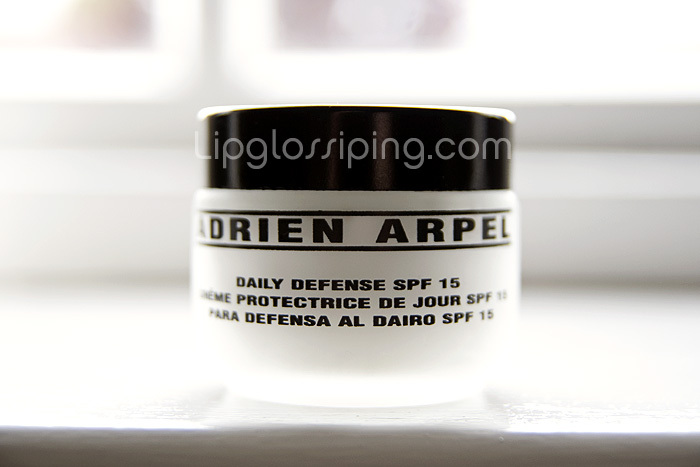 Adrien Arpel Daily Defense Moisturiser SPF15, comes in your standard frosted little glass pot, I do wish that the pot were more opaque as I’ve read that sunlight can diminish the potency of antioxidants, regardless – it just means I store this in a darker place – ‘cos I’m a geek. Let’s see what it says on the back of the box…. …not a huge amount actually. I’m not sure what a ‘measured’ dose is either. It’s a fairly thick cream, slightly solid (in the same way good old Nivea Creme is) with a slight pearlescent sheen. Doesn’t feel at all greasy to the touch and feels very light to rub in. It does leave a slightly white cast if you’re not meticulous with rubbing it in or layer it on a bit too thick – but I find that quite normal with any products that contain SPF. You just need to be a little more careful to ensure that the product is evenly spread as it does disappear. My skin drinks this stuff up like there’s no tomorrow – it causes me absolutely no irritation. It sinks in beautifully and doesn’t make my nose look like an oil slick. 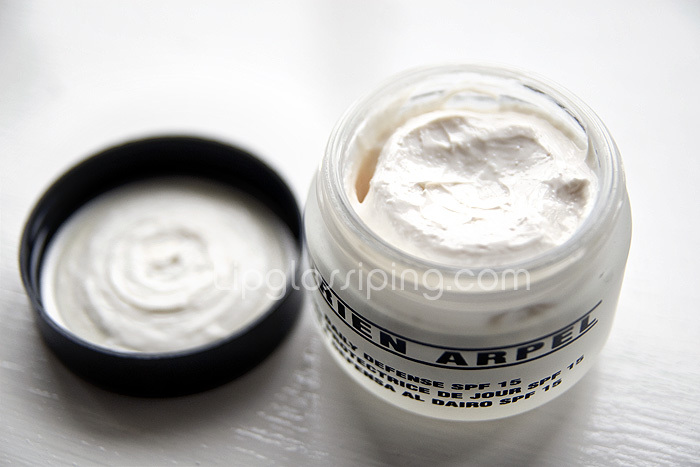 Most importantly it leaves my skin feeling super soft to the touch and is a lovely base for my makeup. Keep an eye out for it (I know I will be! ), it seems to belong in the same category as the Gale Hayman stuff and often appears heavily reduced on the various cosmetic discount websites.